The Lib Dems have dropped to their worst ever YouGov poll rating today with just 6% of those polled saying they would vote for them at the General Election. 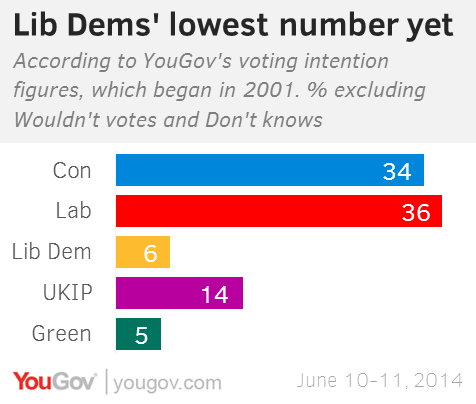 This is the worst result for the Lib Dems in a YouGov poll since the company started in 2001. Significantly, the Green Party are just 1% behind them on 5% and UKIP have more than doubled them on 14%. A closer look at the statistics also spell out some worrying findings for the Lib Dems. Firstly, a look at those who said they voted Lib Dem in 2010. 32% of them now say they plan to vote Labour, 18% Conservative, 13% UKIP, 11% Greens and just 24% said they will stay with the Lib Dems. Compare this in contrast to Conservative or Labour who are holding onto the 76% and 84% respectively of their 2010 voters. It is clear that the Lib Dems are struggling to keep hold of their own voters and importantly, they are also failing to pick up soft Conservative votes (only 1% of those who voted Tory in 2010 plan to vote Lib Dem in 2015). Secondly, on the 5% of young voters (18-24) said they plan to vote Lib Dem in 2015. It is worth highlighting that this is considerably less than the 11% of 18-24 year olds that are planning on voting Green. This could spell bad news for the Lib Dems for two reasons. One it doesn’t bode well for the long-term growth of the party (political parties, like banks and car manufactures target you when you are young hoping brand loyalty will keep you with them the rest of your life). And secondly, it could spell disaster for Lib Dems in some key seats that have large university populations (the one that jumps to mind is Clegg’s home of Sheffield). It is important not to read too much into this. The 5% headline figure is pretty similar to what they have been polling over the last few weeks. It does though just mark a new, unwelcome, milestone for the Lib Dems in their desperate fight to regain some popularity in the polls.